Thirty one per cent of people paying a mortgage or rent spend more than a third of their disposable income each month doing so, a survey for BBC Panorama suggests. Housing charity Shelter said that makes mortgage or rent costs "unaffordable". It said family budgets are being put under "enormous pressure" because of a "shortage of affordable homes". 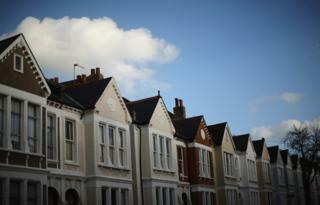 The survey of 1,003 people also suggests 46% of people think property prices are too high in their area. According to Shelter and the Joseph Rowntree Foundation, spending more than a third of your disposable income on rent or a mortgage means you may not be able to afford other basic needs. Shelter chief executive Campbell Robb said: "The widely accepted test of affordability is that housing costs should take up no more than a third of your income." "But in reality, many families don't have any option but to pay out much more," he said. "This sees some faced with impossible choices every day - including between putting enough food on the table or paying for the roof over their head." Among those affected by rising property prices is Abi Reilly, a 33-year-old special needs school teacher. She lives in a terraced house in Reading with her husband, Chris, and two children, five-year-old Daniel and four-month-old Elsie. They spend around 40% of their disposable income on rent. Having rented 13 different properties over the past 10 years, Mrs Reilly said homeownership does not feel realistic. "It feels too far away," she said. "How can we save for a deposit when our rents are going up, energy's going up, everything's going up, wages stay the same, house prices go up? Mathematically it doesn't work." The Ipsos MORI survey commissioned by Panorama questioned a total of 1,003 adults - of whom 697 pay a mortgage or renting a property. Mrs Reilly would belong to the 31% of people in this latter group who pay more than a third of their disposable income on their mortgage or rent. The survey also suggested that 46% of people think property prices are too high in their area and 39% would like to see property prices fall. In August, the Office for National Statistics said the average price of a property had reached a record high of £247,000. ONS figures also show that home ownership peaked at 69% of households 12 years ago. Since then it has been falling and is now at 64%. Panorama has also looked at the Help to Buy scheme set up by the government in April to assist people who could afford mortgage repayments but were struggling to raise a deposit. It allows buyers of new-build homes to put down a 5% deposit and take out a government loan for up to 20% of the value of the property. Help to Buy was extended to existing homes in October, under which the government partially guarantees mortgages. Since it began, there has been a 6% rise in the number of new homes being built. Merryn Somerset Webb, editor-in-chief of MoneyWeek magazine, said Help to Buy risks inflating prices and overheating the housing market. "It's like pouring petrol over the car and setting fire to the whole thing," she said. "You know you might get a little heat in the short-term but the end result is not actually what you wanted." But the government has dismissed concerns about a property price bubble. Housing Minister Kris Hopkins said: "In Yorkshire, the North East and Scotland, house prices have moved very little or in some cases have actually gone backwards." "And that's reflecting where wages are and what money people have actually got to spend. " He also told Panorama: "We've seen nothing yet to suggest there is anything, going anywhere near a bubble at this moment in time." Panorama: The Great House Price Bubble?, BBC One, Monday 11 November at 20:30 GMT and then available in the UK on the BBC iPlayer.